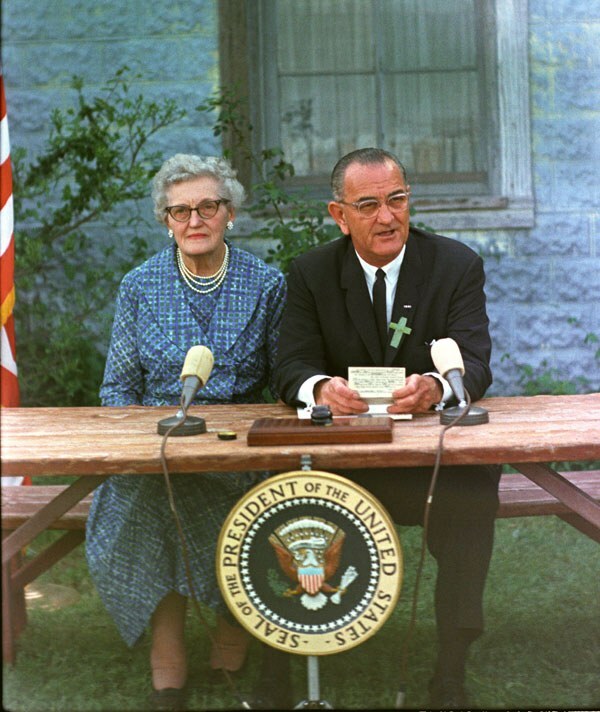 President Johnson signing the Elementary and Secondary Education Assistance Act. Modern education was built on the secular-humanist philosophy of the Enlightenment. Pedagogues such as Johann Pestalozzi, Johann Herbart, and Friedrich Froebel sought to sever education from any external authority, especially religious authority and Divine law. They disdained the wholesome influence of tradition, Christian culture and the family on child development, and rejected the Christian understanding of education as a means to instill virtue and truth in unique souls created in the image and likeness of God. Education became a useful tool to create workers to fill factories, and form the egalitarian masses in the new “democratic” society. Horace Mann and other 19th century pedagogues fought to centralize control over education and place it in the hands of the all-powerful secular state. John Dewey and his disciples conceived of education as an indispensable tool for the builders of American socialism. These evil ideas did not remain stagnant in the lecture halls of liberal universities. By the middle of the 20th century, the United States government began to play a central role in shaping the American education system in accordance with these ideas. At first, government involvement was small and innocuous enough. But as the years and decades passed, the State wielded its financial and political clout to impose ever more socialist schemes on unwilling states and school districts. The baby steps of this long walk were taken by President Lyndon Johnson as part of his so-called “Great Society” government programs. In 1965, Congress passed the Elementary and Secondary Education Assistance Act (ESEA) which among other things funneled billions of dollars of federal funding to public schools across the country. Between 1966 and 2006, approximately $315.1 billion dollars were spent on K-12 public schools, accounting for nearly 10% of the expenditure of local school districts’ budgets. In 1979 President Jimmy Carter greatly expanded federal oversight into local education by creating the Department of Education. Although conservatives vowed to abolish it during the Reagan administration, it only continued to grow in budget and power. President George H. W. Bush gave a big boost to federal oversight in 1992 when his secretary of education Lamar Alexander created a plan called “America 2000” which included nationwide uniform academic standards and testing. Although it never passed Congress, “America 2000” gave impetus to the education reform movement in the 1990s and contained many of the ideas that would later be incorporated into Common Core. In 1993, President Clinton’s submitted his “Goals 2000: Educate America Act” – his very first legislative proposal – closely modeled on “America 2000.” It included a provision to create a new federal entity called National Education Standards and Improvement Council (NESIC) which would recommend “voluntary” state and federal standards and promise money to the states for compliance with those standards. In 2001 President George W. Bush – with the close support of the late Senator Ted Kennedy – signed into law the No Child Left Behind Act (NCLB). It was the largest expansion of federal oversight into education up until that time. NCLB set a goal that by 2014, 100% of all K-12 students would be proficient in reading and math. Most importantly, it required states to prove that they were making so-called “adequate yearly progress” toward this goal. If a state, school district, or individual school could not prove it was making “adequate yearly progress” it would face a series of penalties, including a cut in federal funding. Rather than improve their teaching methods or remove underperforming teachers, many states essentially cheated the system by deliberately dumbing down their own standardized tests, thereby raising the test scores. Many states observed an increase in cheating, as school and teacher performance were tied more than ever to test scores. Nearly all observers admit that NCLB failed to achieve its stated goals. NCLB’s failure, however, certainly did not dampen the enthusiasm of America’s education reformers. On the contrary, when President Obama was elected in 2008, they were ready to make the great leap forward on the path to educational reform with the Common Core State Standards Initiative. Officially, Common Core is a set of “standards” that define what K-12 students are expected to know at the end of each grade. They were written between 2007 and 2009 by three Washington, D.C.-based non-profits: the National Governors Association (NGA), the Council of Chief State School Officers (CCSSO), and Achieve, Inc. Although they have high-sounding names, these private, non-profit organizations have an agenda. As of April 2015, there are standards for two subjects, Math and English, and for all grades from Kindergarten to twelfth grade. In 2008, while Common Core was under development, our country found itself in the midst of a major economic downturn. Every state was suffering major tax revenue shortfalls and was forced to drastically cut back on education spending. Past education schemes were imposed in a top-down fashion, such as an Act of Congress or multiple laws passed through each individual state legislature. Such a method is generally “messy.” But Common Core was done in such a way that it appeared to be originating at the state level without obvious federal backing, thereby sidestepping messy, high profile congressional debates and media coverage. 1. Adopt “a set of content standards…that are substantially identical across all States in a consortium.” Common Core was the only program that matched this requirement. 2. Transfer state control over testing to an inter-state, federally funded testing consortium. There are two of these consortia: PARCC (Partnership for Assessment of Readiness for College and Careers) or SBAC (Smarter Balanced Assessment Consortium). 3. Set up a database that would collect information about students in more than 400 different data points and make sure this database is interoperable with every other state database. To sweeten the pot, “Race to the Top” grants also included waivers to the NCLB “adequate yearly progress” requirements which states were finding increasingly difficult to meet. The Common Core Standards were published on June 2, 2010. The due date for states to submit their applications for “Race to the Top” grants was August 2, 2010. Therefore, to receive a grant, a state had one month to evaluate and test the Standards, a clearly impossible task. In the end, 46 states, the District of Columbia, and every territory except Puerto Rico jumped headfirst into Common Core without even assessing it. Only four states, Alaska, Nebraska, Texas, and Virginia refused. Minnesota adopted the Common Core English standards, but not the math standards. Many of the states adopted Common Core not through their respective legislatures but through their state boards of education. In Wisconsin, only one man, the Superintendent of Education, made the decision for the whole state to adopt it. The education revolutionaries were hoping that Americans, faced with a fait accompli, would acquiesce to Common Core without a fight. Thank God there has been pushback. As of this writing (May 2015), three states have withdrawn from Common Core: Indiana, South Carolina, and Oklahoma. Indiana, although it has officially pulled out of Common Core, still uses the standards themselves under a different name. North Carolina passed a law last year that ordered a review, but not an outright repeal, of the Common Core standards. Several states have pulled out of the Common Core testing consortia as well. More than a dozen additional state legislatures have pending legislation or have had a vote on Common Core. Anti-Common Core groups are active in nearly every state. Polls show that both parents and teachers are increasingly hostile to Common Core. Teacher support dropped from 76% in 2013 to 46% in 2014, and support from the general public has dropped from 65% to 57%. Among those who have heard “a great deal” about Common Core, support has dropped the most. A UCONN poll showed that 61% of respondents who have heard a “great deal” about Common Core said it was bad policy. Progressive education “reformers” have spent more than 50 years trying to impose their ideas on a unwilling American public. They have used many tactics, from subterfuge to fraud to outright intimidation to achieve their goals, with mixed results. With Common Core, the “reformers” seized their window of opportunity during the Obama administration to impose the most radical destruction of American education in history. This pseudo-reform aligns perfectly with the socialist vision of John Dewey and the long line of liberal “philosophers” that came before him. Unlike the times of John Dewey, there is a very large, vocal, well-organized, and growing resistance to this socialist education experiment. Common Core is much worse than other socialist programs, since it targets the most vulnerable and impressionable: our children. For the good of our children and the future of our nation, God-fearing Americans must rise up with one voice and fight this pseudo-reform before it’s too late.